MODO been commissioned to design a sculpture in the art district of 798, Beijing, China. 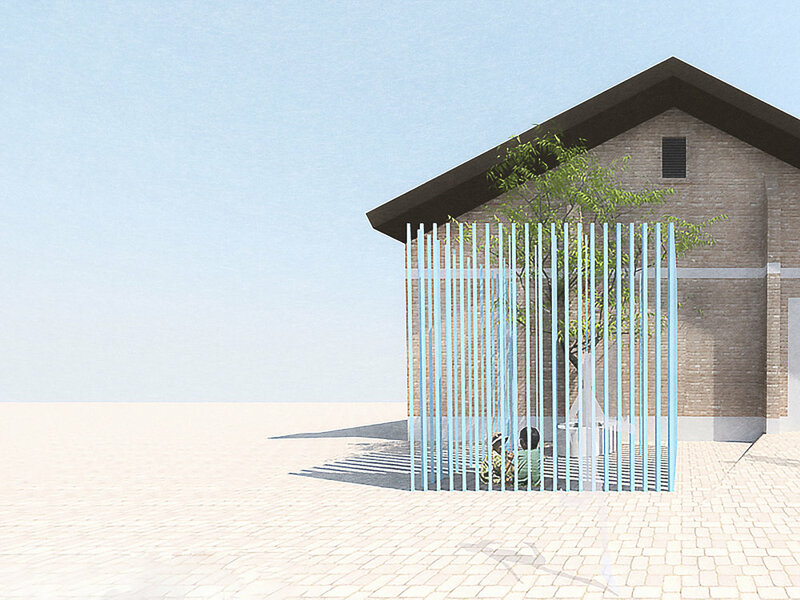 In an area saturated by eye-catching sculpture, with the primary purpose to draw attention to only the object itself, this proposal seeks to illustrate the beauty of the ordinary and the existing. The site is relatively simple, there is an existing tree, brick facade of a gallery and brick paving to the ground . Instead of clearing the tree, which is the typical response and also the clients initial brief, we have decided to surround it with a set of free-standing triangular columns. The U shaped plan of columns is used to block, screen, frame and distort the view of the tree. The column, is formed out of folded steel sheet. On one face the steel will be polished to create a mirrored finish, while the other two will be painted. The project has two modes of interaction, view from the exterior and view from the interior. 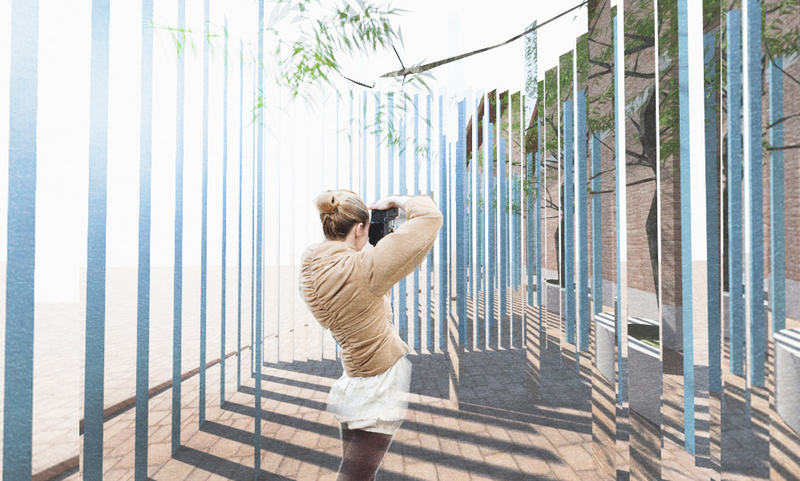 As you move around the piece from the exterior, the angled mirrored surfaces will slowly unveil, frame, screen and manipulate the one's view of the tree. The tree is never completely revealed from the exterior, this denial is used to appeal curiosity and to draw visitors into the interior. Internally, one corner the space almost disappears completely and allows the space to spills out into the surrounding, while on the opposite corner the reflected image of the tree is now completely distorted and recomposed. In this one space, the sculptures re-acquaints the viewer with the existing (tree), re-positions the viewer to examine the ordinary (surrounding) and invites the viewer to actively engage and become part of the art. At its core the sculpture looks to its surrounding to establish its presence amongst the many other eye-catch extroverted pieced. Presenting a more subdued personality, the piece employs methods of screening, blocking and framing to heighten the viewers awareness of its environment and of course the central tree. In ways, the sculpture is more about the tree than the steel columns itself. Fittingly the sculpture is named after the Chinese word for Tree (Shu).